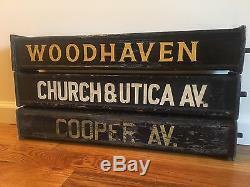 This is my lifetime collection of rare wooden traction trolley car signs. It is extraordinary to find one of these... It has taken my lifetime to find three. 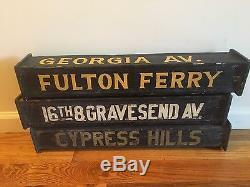 These exceedingly rare four-sided wooden trolley signs most likely date to the 1880's era. 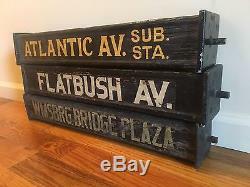 These beautiful pieces of Brooklyn NY trolley history measure 25" by 4"square and are solid heavy wood blocks with steel end caps. Each steel end cap has a metal peg which fit into a geared handle which allowed the trolley operator to turn the sign. 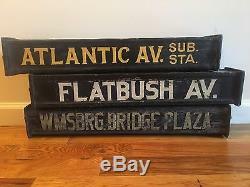 Whether your interest is early Brooklyn NY history or vintage traction trolley memorabilia these are must have items! You will likely never find another set! 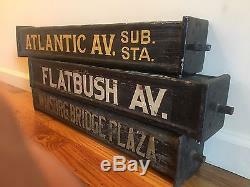 These truly belong to be in the Museum of the City of New York. The overall condition is absolutely remarkable with some beautiful crazing in the paint. 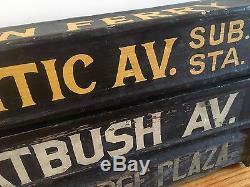 In 35+ years of collecting, I have only seen three of these four sided wooden trolley signs and here they are. 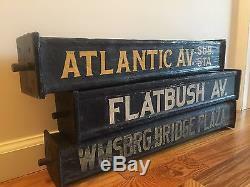 These signs are in extraordinary condition and 100% original. 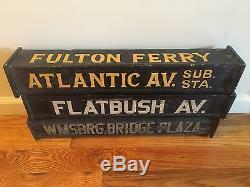 The overall condition varies a bit from near mint with very bright, sharp and rich lettering and essentially no paint loss, no rust, almost no wear at all to the Williamsburg Bridge Plaza sign which does show some wear. 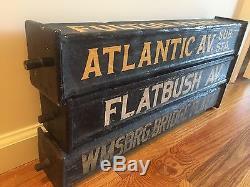 These are beautiful and extraordinarily rare pieces of Brooklyn trolley history! Don't miss this very rare opportunity! Trolley service began in Brooklyn in 1832 (two years before Brooklyn was incorporated into a city) and was originally a simple boxcar pulled by a horse over rails embedded into the street. The horsecar was much more efficient than the coaches then in use. Running along rails eliminated most of the friction, allowing horses to pull a much greater load with a lot less effort. Soon horsecar lines crisscrossed the City of New York and the rapidly growing City of Brooklyn began its own series of horse drawn trolley lines in 1854. Although the horsecar was a revolution in urban transit, it had its shortcomings. Horsecars ran about as fast as a brisk walk and created their own form of pollution (putting many men to work cleaning the streets). Still, for riders they provided ease in transit and shelter from the elements. Horsecars connected the city's various neighborhoods; allowing riders to transverse the city and connect to railroads, ferries and other forms of transportation. The expansion of horsecar lines fostered the city's development along their corridors. As the industrial revolution took hold, new technologies became available. Shortly after the Civil War, the cable car was introduced in many American cities; replacing many of the horsecar lines. The cable car operated by attaching the car to a constantly running cable underground. To stop, the operator would detach from the cable and apply the brake. Cable cars were larger and faster than horsecars and provided an intermediate step in the development of the streetcar. However, cable cars also had major drawbacks. They were expensive to operate and maintain. Also, the cable propelled them at a constant speed and therefore could be quite deadly rounding sharp curves. In 1888 Richmond, Virginia became the first city to successfully electrify a streetcar line. The City of Brooklyn followed shortly thereafter, electrifying the Coney Island Avenue line in 1890. Subsequently, the remaining horsecar and cable car lines were replaced by this innovative, highly efficient energy source. The last cable car line in New York City ended its run in 1905; the last horsecar line ran up until 1917. 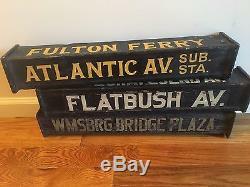 The item "3 Vintage Brooklyn NY Traction Trolley Car Train Old Antique Wood Station Sign's" is in sale since Monday, July 24, 2017. This item is in the category "Collectibles\Transportation\Traction & Trolleys". 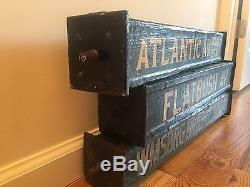 The seller is "wallst2" and is located in Brooklyn, New York. This item can be shipped to United States.